The benefit of reviewing a film later than usual (I could not for the life of me make it to any of the Samba media screenings, so Think Tank Communications provided me with a double pass to see it once the film was out) is that you get to hear what other reviewers think about it. I have to say, though, while other reviewers’ consensus was that Samba wasn’t as great as they’d hoped, I found it rather great. Put another way: As a follow-up to The Intouchables, it falls a little short. But as a standalone film, it holds its own just fine. 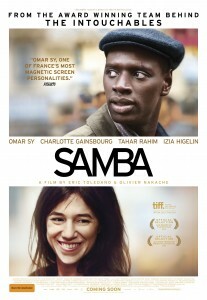 Although Samba isn’t precisely the sequel to The Intouchables, it was weighed down by the weight of sequel-like expectation. This was contributed to by the fact that the writing-directing duo Éric Toledano and Olivier Nakache reunited for the film, along with star Omar Sy. In Samba, Sy stars as protagonist Samba (‘like the dance’), who winningly portrays an illegal alien trying to stay in France at all costs. After 10 years eking out a living in Paris working odd, lowly paid, and entirely insecure jobs (such as a construction worker, dishwasher, window washer, garbage sorter, and security guard), he’s picked up by the authorities on the Tube. It’s in the lock-up that he encounters Alice, played by Charlotte Gainsbourg, a neurotic woman volunteering to help illegal immigrants while on sick leave from her executive job due to burnout. Both Samba and Alice are in their own ways displaced and trapped. Samba’s willing to do whatever it takes to get working papers; Alice, a refugee from the corporate world, is trying to determine how to reset her life, while concurrently medicating to try to counter her anxiety and stress-related insomnia. Don’t give them your number, she’s told by the more experienced volunteer. Don’t get personally involved. Of course, Sy’s Samba is warm and affable and Alice can’t help but be drawn to him. The film is a social dramedy slash cross-cultural romance, with France’s immigration hurdles providing the high-stakes context. For me, the levity of the production was its strength. The Sisyphean existence Samba and his peers are forced to live, grappling daily for short-term gigs all the while sandwiched between worrying about getting caught and the pressure their families back home are placing on them to send money, is bone-wearyingly relentless. As Samba yells during a scene of particularly heightened emotions, even the mailman is freaking him out. There are some incredibly touching moments in the film—and simple too. A conversation in a service station is one. A post-party group conversation around a table is another. Witty, bittersweet dialogue flows, written brilliantly and delivered with timing and panache that make it insightful and touching. There were also some tension-breaking humorous moments—one of the best involved a conversation about a piece of red paper. While the Alice character was colder and more two-dimensional than Sy’s Samba, Gainsbourg handled the role decently well and found some ways to if not spark with Sy, then at least humanise her character and make her believable. My greater concern was that the film was ever so slightly too long. But I was still incredibly moved by it. For for me, the film is part of a larger conversation of poverty-, war-, and desperation-led immigration around the world, and the lack of acceptance people often receive when they arrive in foreign countries. Australia—a country described as having tiny hearts and balls of steel for its treatment of people seeking asylum—is not so dissimilar to the France in which Samba is set. And that’s not something to be proud of. So, while Samba mightn’t be as successful as The Intouchables, but it nevertheless warrants a watch and its issues warrant wider consideration. I’m breaking with review consensus to say: check it out.